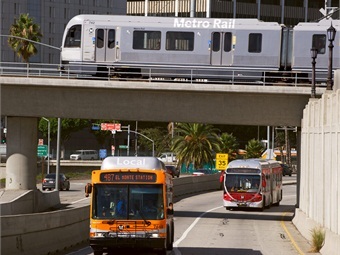 L.A. Metro CEO Phillip Washington today delivered his first annual State of the Agency report to the Los Angeles County Metropolitan Transportation Authority (Metro) Board of Directors calling the agency sound, with many challenges ahead. However, Washington said those challenges are being addressed and the many opportunities that lie ahead of the agency are achievable. Highlighted in his report to the Board included fiscal stability with the creation of a Risk Allocation Matrix (RAM) to deal with future operational deficits and optimization of Metro services and fare media in the coming years. Enhancing the ridership experience was also a main focal point of his address, with the goal of increasing ridership as a major priority for the agency. Efforts already in the works include providing cellular service in the subway system, getting a better understanding of the communities and customers Metro serves, enhancing safety and security and increasing Metro’s technological advancements to benefit the rider. On the issue of declining ridership, Washington noted that ridership is down nationally but that’s not unexpected given its cyclical nature. 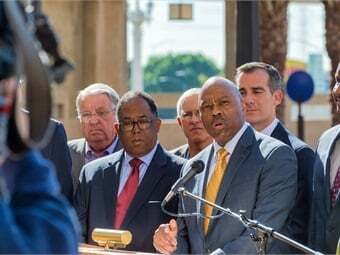 L.A. Metro is taking a long-term view and looking at a 30-year planning horizon. It was noted that an additional 750,000 people are forecast to relocate to L.A. County in the next decade. L.A. Metro created a Ridership Task Force last year to study the ridership decline issue, both in L.A. County and nationally. Metro is now looking to speed up and optimize bus service across the system and is in the midst of using technology to enhance the ridership experience to attract riders. The annual State of the Agency report went on to note that challenges and priorities for 2016 include on-time and on budget program management that include two new rail line extensions opening, the Gold Line Extension to Azusa in March and the Expo Extension to Santa Monica in May, a true vision for Union Station, and the implementation of Operation Shovel Ready, where staff will work to advance projects from the planning stage to be construction-ready. Additional challenges and priorities for 2016 include workforce development and performance management, building career pathways for Metro employees and strengthening the agency’s safety culture including implementing innovation in all areas and creating a culture of innovative thought.